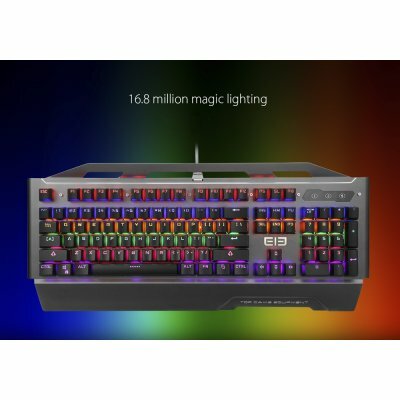 Successfully Added Game2 LED Gaming Keyboard - QWERTY, 104 Key, Mechanical, TTC Switch, 14 Lighting Mode, 16.8 Million Colors to your Shopping Cart. The difference between good and great gaming is in how you interact with the computer. Thanks to the Game2 keyboard you can be in full controls and enjoy a better, more responsive gaming experience as the sensitive mechanical keys respond to your fingertips and will even light up as you play. The Elephone EleEnter Game 2 is a mechanical QWERTY gaming keyboard ideal for gamers. This tough keyboard has a metallic covering making it rigid and robust for great durability. Furthermore, the keys on the Game2 keyboard have been tested to withstand normal usages up to 60 million cycles ensuring superior performance and a great life span. Using mechanical TTC keys ensures a better response and feedback so the Game2 keyboard is easier to use with faster sure key presses. The built-in LED lights can represent any color of the rainbow and with the Game2 Keyboard each of the 104 keys can be set to a color of your choice added to that, there are 14 backlight modes making this the most dazzling keyboard around. A 175cm braided USB cable with electrostatic magnetic ring provides interference free connectivity for a USB 1.1 /2.0 /3.0 interface and compatibility with WinXP, Vista, Win7, Win8, Win10 operating systems ensures its well supported for your gaming computer. This colorful gaming keyboard comes with a 12 months warranty, brought to you by the leader in electronic devices as well as wholesale computer accessories and electronic gadgets..